school in-session calendar attached below. "Scouting's Journey to Excellence" is the BSA's council performance recognition program designed to encourage and reward success and measure the performance of our units, districts, and councils. It is meant to encourage excellence in providing a quality program at all levels of the BSA. Below is the 2018-2019 dates for den meetings this year! Remember to share any pics you've taken at a scouting event, whether a Pack or den meeting. They can be uploaded per these instructions HERE! They'll be great to have archived for future reference/use! Gerald R. Ford Scouts in the news!! Opportunities will always abound in the BSA! Cub Scout Pack 3049 is located in Holland, MI and chartered by the Lakewood Elementary Parent Teacher Organization. Our Mission: Create a fun, safe, outdoor environment for our Cub Scouts to learn the twelve virtues of Scouting, build their character, and develop their leadership skills. Create fun and memorable experiences. Develop our Cub Scouts into Boy Scouts. We believe that Scouting is best character development and youth leadership program available. We believe we are making a positive contribution to our kids and their friends. We believe that Cub Scouting is a family program. Anyone who is entering 1st through 5th grade are eligible to join Cub Scouts. Our Scout year follows the school year and starts up in the fall. We welcome kids from Lakewood School, Black River School, Waukazoo, and more. We will communicate our fall recruitment drive at school open houses and student backpack mail. Come and check out what Cub Scouts Pack 3049 has to offer for your kids. You can join scouting at any age. You are going to have lot of fun and you will learn a lot of great new things this year. Don’t worry about not knowing as much as some of the experienced scouts. Your fellow scouts will welcome you to our den and they will help you out anyway they can, so don’t be afraid to ask for help. You can also ask me, your den leader, for help as well. As a new scout, you will have to complete The Bobcat Trail on your own and with some help from your parents. The contents of the Bobcat Trail can be found in your Handbook and in the Bobcat Badge section at left of this page. After completion, we will conduct a Bobcat ceremony to mark your achievement and welcome you to the Pack. You will learn things like the Cub Scout Promise, the Cub Scout Handshake, the Cub Scout Sign and more. Welcome to the Pack! After 5th grade you join Boy Scouts and you will make your way through a series of levels towards becoming an Eagle Scout. Each new level is earned through the cumulative achievement of merit badges. A Boy Scout will start as a Boy Scout, to Tenderfoot, to Second Class, to First Class, to Star, to Life Scout, and after completing the Eagle Project, earning the rank of Eagle Scout. Many Boy Scouts have become an Eagle Scout on a three year fast track program. The deadline for becoming an Eagle Scout is your 18th birthday - no exceptions. Boy Scouts is one of the most highly respected youth leadership programs in our country and Eagle Scouts are found at the highest levels of leadership throughout the business world, government, and more. Past) Jan 11, 6:30-8p	Pack Meeting, Popcorn prizes, Pie-in-the-face party! Past) Sept 6, 6-7p	Pack 3049 School Night for Scouting, Boys wishing to sign up or to learn more about our Pack. Current Scouts welcome as well. Sign-up email was sent, RSVP by Aug 7! 16455 Ransom St, Holland, MI 49424 - North side of the road. Past) Jan 6, 6:30-8p	Pack Meeting, Popcorn Sale Awards/Pie throwing - Lakewood Elem. Past) Dec 9, 6:30-8p	Pack Meeting, Toys for Tots, uniform inspection - Lakewood Elem. Past) Nov 11, 6:30-8p	Pack Meeting, Egg Drop competition! - Lakewood Elem. Past) Oct 14, 6:30-8p	Pack Meeting, Pumpkin Carving! - Lakewood Elem. Past) Aug 30, 5-7p	Lakewood Elem Open House, INVITE your friends to stop by our table! Past) Aug 19-20, 7p	Grand Rapids Whitecaps Scout Night/Campout on the field! Past) May 30 9:30a	Memorial Day Parade, Meet near Alpine Rose at 9a! Past) Jan 23, 7p	Scout Night at GR Griffins Hockey! Past) Jan 16, 1-3p	Sledding at Pigeon Creek! Past) Jan 8, 6:30p	Pack Meeting, Lakewood Elem, MPR, Popcorn Awards! Past) Dec 11, 6:30p	Pack Meeting, Lakewood Elem, MPR, Toys for Tots, Christmas catapults! Past) Nov 13, 6:30p	Pack Meeting, Lakewood Elem, MPR, Egg Drop competition! Past) Oct 16, 6:30p	Pack Meeting, Lakewood Elem, MPR, Pumpkin Carving! Family event, bring all your own gear & bait. Prizes! Past) Sept 1, 5-7p	Lakewood Elem Open House, INVITE your friends to stop by our booth! Past) Aug 28, 7p	WM Whitecaps Scout Night/Campout on the field! Past) Congratulations to Andrew S, Connor M, Derek P, Jaysen H, Josh E, Lucas M, Ryan M, Sean D, for achieving Cub Scoutings highest rank, Arrow of Light! Past) Feb 13, 6-8p	Blue & Gold Banquet, Webelos Arrow of Light/Crossover Ceremonies! Past) Jan 30, 6:30-8p	RESCHEDULED AFTER SNOW DAY! Pack Meeting-Lakewood elementary, Popcorn Awards and Pie-Throwing! Past) Jan 24, 7p	Griffins Hockey Scout Night! Past) Dec 12, 6:30-8p	Pack Meeting-Lakewood Elementary, Toys for Tots, Lego robots! Past) Nov 21, 6:30-8p	Pack Meeting-Lakewood Elementary, Bobcat Badge Ceremony, Nerf blow gun fun! Past) Oct 17, 6:30-8p	Pack Meeting-Lakewood Elementary, Pumpkin Carving! -Please bring whatever number of pumpkins you want for your family. It can be a large pumpkin or a small gourd, already cleaned out on the inside or not. -Please bring newspaper and maybe plastic grocery bags to help contain the mess. -You can carve them or decorate them, carving tools and some decorations will be provided by the Pack, but it may also be helpful if you can bring some tools and decorations if you wish. Hot glue guns and craft glue will be provided. PLEASE NO KNIVES! Past) Oct 12, 2-4p	Fishing at New Docks near Holland St. Park! Earn Fishing belt loop! 13 new scouts get a free rod & reel! All Scouts can earn the belt loop, earth worms provided! All family is welcome! All of the rest of the Scouts (and siblings) can bring their fishing gear and do some fishing and earn a belt loop if you haven't already! Any parents are welcome to stay as well but CANNOT hold a pole in the water without a fishing license. Past) Sept 9, 6:30-7:30p	Pack 3049 School Night for Scouting at Lakewood Elem! If you have recently registered or expressed interest in joining our Pack, come and ask questions/get answers and get started with our Pack!! See attached flyer posted below for more details! Past) Aug 22, 7p	Scout night at WM Whitecaps with overnight campout on field! Open to the whole pack-REGISTRATION IS NOW CLOSED. 28 PARTICIPANTS!!! All Scouts in uniform are invited to walk the parade with Pack 3049/3030! We'll meet at approx. River Ave & 8th Street at 9am for a 9:30 parade start time. Parents will need to meet your Scout for pickup at the parade end at the cemetary on 16th St. It takes approx. 30 min to walk the parade route. Past) Congratulations to Andrew G. & TJ M. for achieving Cub Scoutings highest rank, Arrow of Light! Campout until 10:30a the next morning. See attached flyer below for details!, RSVP	needed! Past) April 25, 6-8:30pm	Pack Mtng - Kamp Kiwanis Klean Up Service Project! - A 4-part meeting! 1) give back to Kiwanis by cleaning up the camp! 3) rank achievment/electives wrap up! 4) s'mores n' such on the campfire! March 22, 8:30am weigh-in followed by 10am race! Beechwood Church. All family members are welcome to come cheer on our Scouts! An open division following for siblings/parents. Scroll down for attached event flyer! Past) Blue & Gold Banquet! - Happy 84th Birthday to Cub Scouting!! Feb 21, 6:30-8:30pm Lakewood MPR! Pack Scout awards! A very cool Scout/Sibling project & game! A sundae dessert bar! Don't miss out, all families are welcome! Scroll below for attached event flyer! Past) Dec 13 - Pack Meeting, 6:30-8:00 Lakewood MPR! Popcorn awards, pie-in-the-face fun!, Toys for Tots! Bring 1+ toys unwrapped to give to the Marine who will be attending to deliver the gifts to the organization and to inspect our boys' uniforms! Past) Dec 14 - Scout Night at GR Griffins Hockey Game! $14/person, Families welcome! Sign-up sent in email on 12/2/13, commitment due 12/4 by noon! UPDATE: There are 30 signed up to go-should be a good time! Past) Pack Meeting Friday, Nov 8, 6:30-8p, Lakewood Elementary. Scout awards and an awesome family project of making neckerchief slides! Small para cord projects for the siblings. Bring any material you would like to use to construct your slide but many materials will also be provided for construction. Fall Recruiting efforts continue through Sept & Oct this year! All scouts will receive a cool Cub Scouting hat if you bring a friend into our Pack! Talk to your friends and tell them how much fun it is and the great things you get to do! Last thing, Annual Pack registration is 1/2 off for 1st year Scouts, only $25! -You can carve them or decorate them, carving tools and some decorations will be provided by the Pack, but it may also be helpful if you can bring some tools and decorations if you wish. Hot glue guns and glitter glue will be provided. 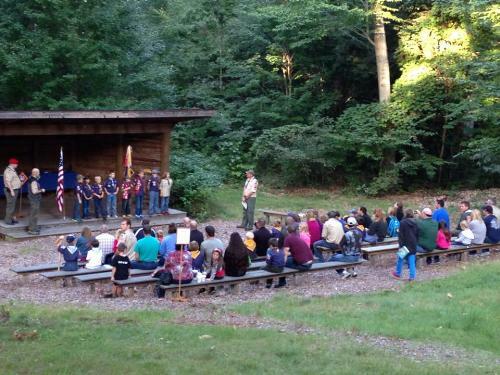 Past) 2013-2014 Scouting Season kick-off Pack Meeting/Camporee @ Kamp Kiwanis - Sept 20-21 see map here Meeting is 6:30-8:00. See the flyer attached below for all the details including a required RSVP! Past) Scout Night and overnight camping at the GR Whitecaps baseball game! Aug 16, 7p. RSVP required! Past) Congratulations to Colin B, Jeffery G, Lane S, Remy R, Tyler B, for achieving Cub Scoutings highest rank, Arrow of Light! Past) Pack 3049 Marching in Memorial Day Parade!-Monday, May 27, meet @ 9:00AM, on West side of Central Ave between 8th & 9th streets. Wear your full uniform and comfortable walking shoes. It takes about an hour to march and parents/siblings are invited to march along. All must arrange for pick up at parade's end at the entrance of Pilgrim Home Cemetery on 16th Street West of Menards. Past) CHANGE OF PLANS! - This event is now only Friday night, April 19, 6-10PM, NOT an overnight campout. - Kamp Kiwanis. We will have a campfire, outdoor games and outdoor/indoor projects. This will be the perfect time to finish up any Rank achievements, arrow point electives, or belt loops/pins in preparation for the end-of-year Pack Meeting in May. A parent, mom or dad, is suggested to stay with your scout for the duration of this event. This is not a family event. See attached flyer below for more details! Past) Saturday, Mar 16, 8-11am, Beechwood Church - Pinewood Derby Race! All families welcome! See attached flyer below for more details. Past) Cub Scout Pack 3049 Info/Signup night at Lakewood Elementary. Monday, Sept 10, 6:30-7:30pm, Multi-purpose room. This is the place for new scouts/parents to come ask questions and learn the specifics of our Pack! See flyer attached below! We had a great night! 12 new Scouts in Pack 3049 so far! There is still plenty of time to get started! Email us here! Past) UPDATE 4PM Friday: We will be having the Pack meeting indoors at the Lodge at Kamp Kiwanis tonight. But plan on some outside activity/camping out as planned. Tenters can change to sleeping cabins if they'd like. 2012-2013 Scouting Season kick-off Pack Meeting/Camporee @ Kamp Kiwanis - Sept 21-22 see map here Meeting is 6:30-8:00. See the flyer attached below for all the details including a required RSVP! 2) Uniform inspection from a Marine to receive a special pin! Uniform tucked in, all badges and beads properly displayed, and neckerchief on! This includes all leaders! Scroll to the bottom of this page for uniform guides. Contact Cubmaster here if there are uniform questions/challenges. 3) Popcorn awards to be given including smear the Cubmaster for the 600 club! 4) Pack t-shirts will be available for pick-up and purchase! If you have not yet paid for your t-shirt, please bring cash/check made out to Pack 3049. Past)Tues, Feb 12 6:00-8:00pm - Pack 3049 Blue & Gold Banquet, Beechwood Church. Changed from the original Friday, Feb 15. See attachment below for event details! Past) Congratulations to Avery M, Jack H, Will T, for achieving Cub Scoutings highest rank, Arrow of Light!